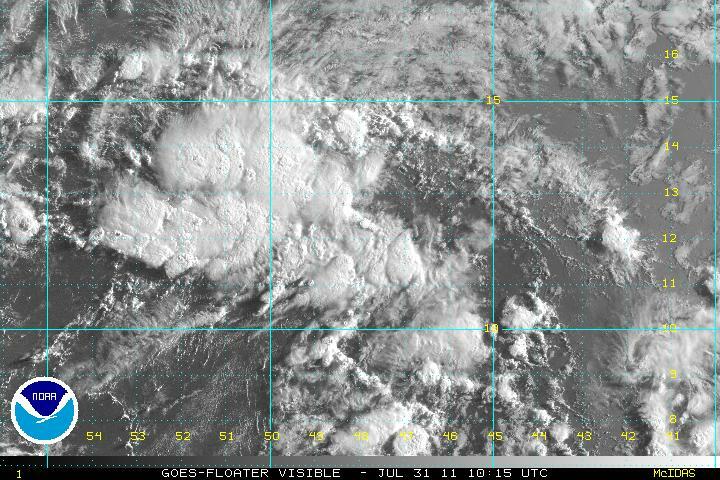 A strong tropical wave continues to organize and willl likely become our next tropical depression later today. Interests in the Leewards and northern Antilles to the Bahamas should follow this system. As of 7 am edt / ast the tropical disturbance was centered 650 miles of the Lesser Antilles. It was moving wnw at about 10-15 mph. Top sustained winds estimated at 25 mph. Pressure was estimated at 1004 mb. Early model forecasts take this system west northwest into the Leewards during the next 2-3 days. After that the models spread from the northern Antilles to east of the Bahamas. The track will become better defined once the low organizes better. Heavy showers and storms stretch from the southern Leewards into the northern Windwards. Winds on the islands are generally only gusting to 25-30 mph - below tropical storm force. NHC decided to classify despite sustained winds of 40 mph not being observed over the islands. This probably was a good call with the system likely gaining strength before the next landfall in the northcentral Caribbean. 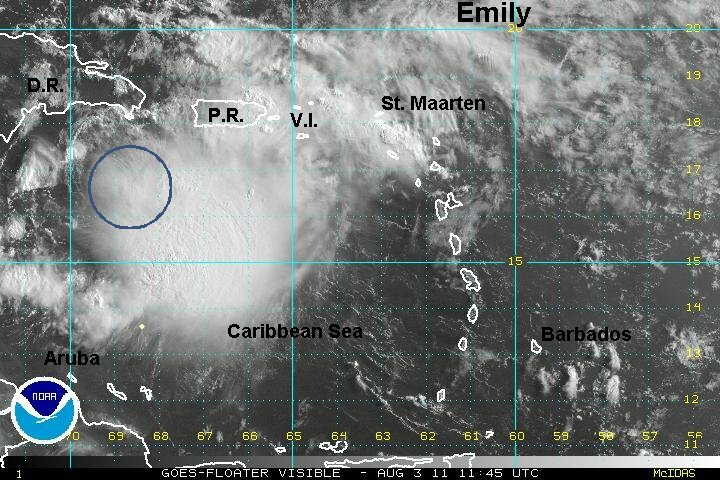 As of 7:30 pm edt / ast Emily was centered at 15.2 N / 62.0 W or 50 miles wsw of Dominica / 350 miles se of San Juan, Puerto Rico. It was moving west at 17 mph. Top sustained winds estimated at 35 mph (40 mph NHC last advisory). Pressure was estimated at 1006 mb. Forecast models have shifted from east of the Bahamas to the northern Caribbean now to the central Bahamas. Models should become more reliable now that a circulation has formed. If Emily does indeed cross Hispaniola is will greatly disturb the circulation. The hurricane center restrengthens Emily east of Miami by Saturday as a minimal hurricane. Remember that long range forecast models generally have large errors so don't think of the position as an exact location several days out. The cdo or central dense overcast from Emily grew overnight. This is the area of rain and storms around the center of the circulation. Rain now extends from the Windwards and Leewards west into the eastern Caribbean. A few squalls are northwest into Puerto Rico. As of 5 am edt / ast Emily was centered at 15.5 N / 64.0 W or 245 miles se of San Juan, Puerto Rico. It was moving west at 16 mph. Top sustained winds estimated at 40 mph (40 mph NHC last advisory). Pressure was estimated at 1006 mb. NHC has decided to make Emily a tropical storm east of Miami instead of a hurricane. Per my last discussion, the interaction with Hispaniola will be critical as it can destroy a tropical cyclone. It is also interesting to note that it is rare for a tropical cyclone to grow in the eastern Caribbean if it hasn't organized yet. A more detailed discussion will be posted later today.... sorry for the short one this morning. Hurricane hunter recon aircraft show that Emily has changed little since late yesterday. Pressure has not changed in almost 24 hours which is an excellent gauge of strength. Despite this, heavy rain has fallen over parts of Puerto Rico. The mountainous terrain has received over six inches of rainfall estimated by doppler radar. At this time it appears that the main impact to Hispaniola - Haiti and the Dominican Republic - will be heavy rain with flash flooding likely. With the latest recon I feel that the maximum sustained winds are a little less than the official hurricane center estimate. 1006 mb is a fairly high pressure for sustained winds of 50 mph and the low center is being affected by westerly wind shear. Interests in the Bahamas and eastern southeast U.S. coast should follow the progress of Emily. As of 8 am edt / ast Emily was centered at 16.6 N / 69.0 W or 145 miles sse Santo Domingo, Dominican Republic. It was moving west at 14 mph. Top sustained winds are estimated at 45 mph (50 mph NHC last advisory). Pressure was estimated at 1006 mb. Forecasts show Emily passing over either central or western Hispaniola during the next day. The circulation of Emily could be damaged beyond repair if it crosses the central mountains. If Emily veers a little west over Haiti then the circulation could remain intact as the northernly turn is made. Late Tuesday into Saturday Emiley should be moving northward though the central Bahamas. If Emily emerges from the central mountains of Hispaniola then it will be in a very weak state. If it emerges from Haiti, Emily could retain its tropical storm strength. Most models at this time strengthen Emily as it departs the northern Bahamas where more favorable upper air conditions exist. A recurve east of the U.S. coast is currently predicted. A large part of this forecast is depended on the track of Emily as it crosses Hispaniola. 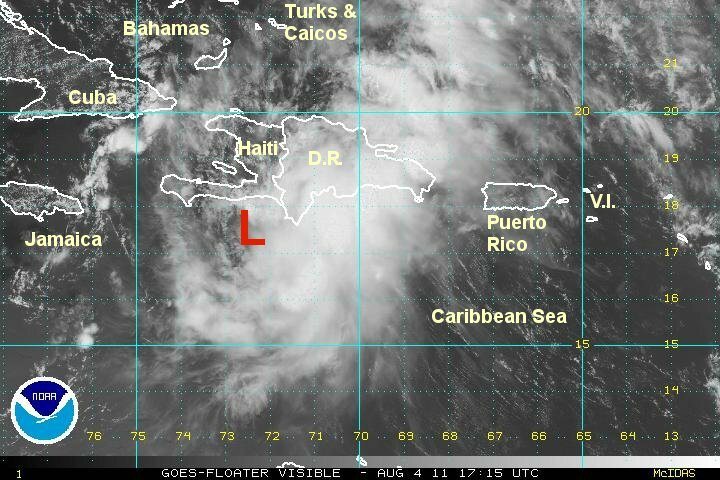 Westerly wind shear exposed the center of circulation just after midday. With this being the case, there is no way that Emily is 50 mph still. 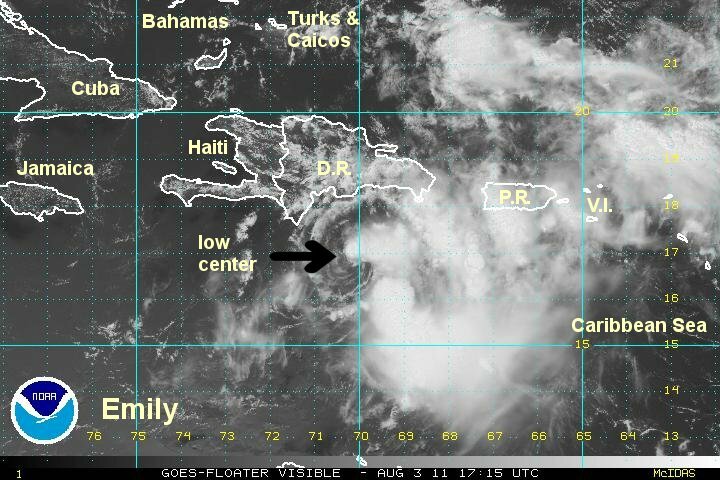 The latest satellite imagery shows some deep convection near the center again. In a weakened state the low center will be steered by the low level trade winds....taking it farther west. We will be watching this closely today. If Emily stays this weak for another 6-12 hours, the Bahamas may get very little effects other than some rain. Interests in the Bahamas, Hispaniola, Jamaica, eastern Cuba, and eastern southeast U.S. coast should follow the progress of Emily. As of 2 pm edt / ast Emily was centered at 16.8N / 70.3 W or 120 miles ssw Santo Domingo, Dominican Republic. It was moving west at 14 mph. Top sustained winds are estimated at 40 mph (50 mph NHC last advisory). Pressure was estimated at 1006 mb. Forecasts show Emily passing over western Hispaniola during the next day. The circulation of Emily could be damaged beyond if it crosses the mountains of Haiti. Also, wind sheer has increased and Emily may move farther west than models indicate. 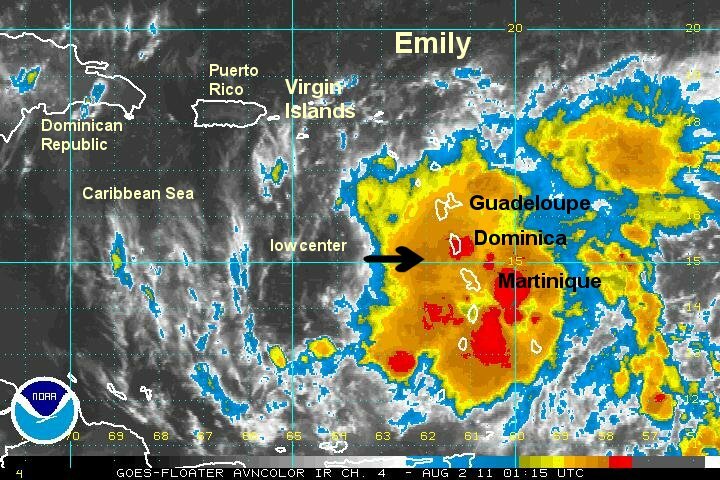 Emily is near the coast of Hispaniola. The main threat is from flash flooding as rainfall amounts of 5-20 inches of rain will fall over the island. The heaviest amounts of 10-20+ inches are possible over the mountainous terrain. 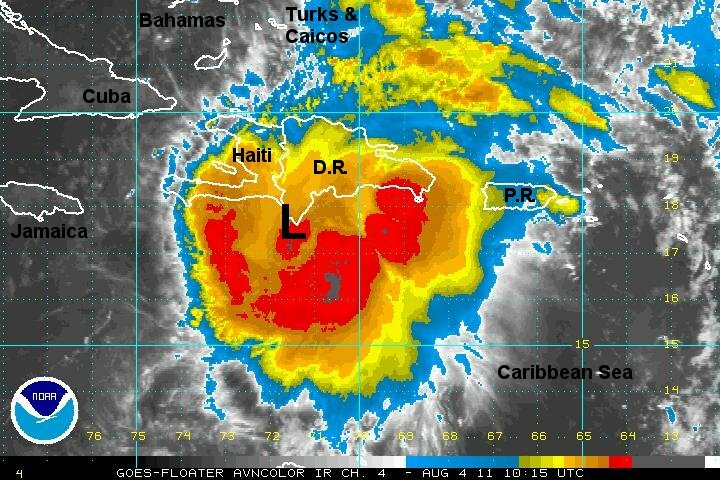 As of 7 am edt / ast Emily was centered at 17.4N / 71.9 W or 85 miles sse Port - au - Prince, Haiti. It was moving wnw at 7 mph. Top sustained winds are estimated at 45 mph (50 mph NHC last advisory). Pressure was estimated at 1006 mb. Forecasts show Emily making a turn toward the northwest passing over western Hispaniola today. The circulation of Emily could be damaged beyond repair if it crosses the mountains of Haiti. After crossing Haiti, Emily will likely weaken. It will then try to restrengthen as is moves though the Bahamas into the open waters east of the U.S. coast as it recurves away from the U.S. Right now it appears that Emily will be a weak tropical storm as it moves into the southern Bahamas. It's possible that it could become a tropical depression ft the circulation is damages severely enough. Emilly may recover to moderate tropical storm strength as it moves through the northern Bahamas in a few days. Emily's circulation is disintegrating. It is possible that the circulation will collapse into a tropical wave. Right now we don't believe that the winds are 40 mph like the official estimate states. Recent recon reports suggest sustained winds of 30 mph to no more than 35 mph. Regardless of the circulation heavy rain is still impacting Hispaniola. The heaviest amounts of 10-20+ inches are possible over the mountainous terrain. NHC forecasts continue to show Emily moving through the Bahamas and recurving east of the U.S. coast over the next several days. 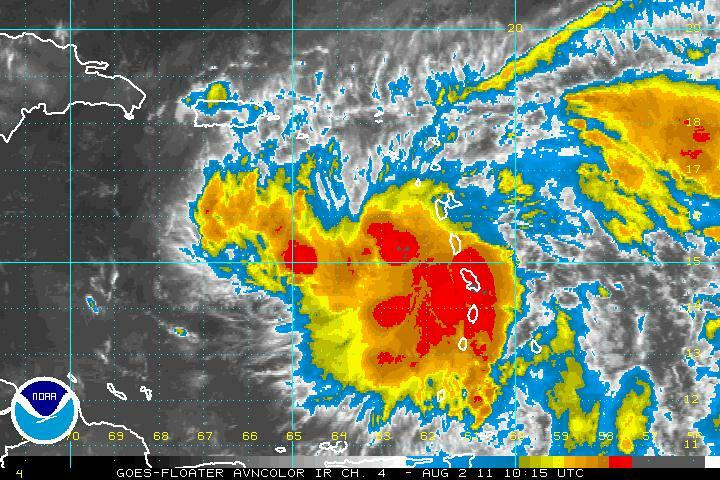 NHC has Emily becoming a hurricane as it pulls away from the U.S. This forecast is in jeopardy. If Emily's circulation disintegrates this track will obviously not verify. As mentioned in the previous update, Emily is no longer a circulation. This will be the last update unless regeneration occurs. Radar and satellite imagery show that a tropical depression is reforming in the northern Bahamas between Andros Island and Grand Bahama. The main threat is heavy rainfall of several inches in the northern Bahamas. As of 12 pm edt / ast the remnants of Emily were centered between Andros Island and Grand Bahama Island. It was currently showing little motion Top sustained winds are estimated at 25 mph. 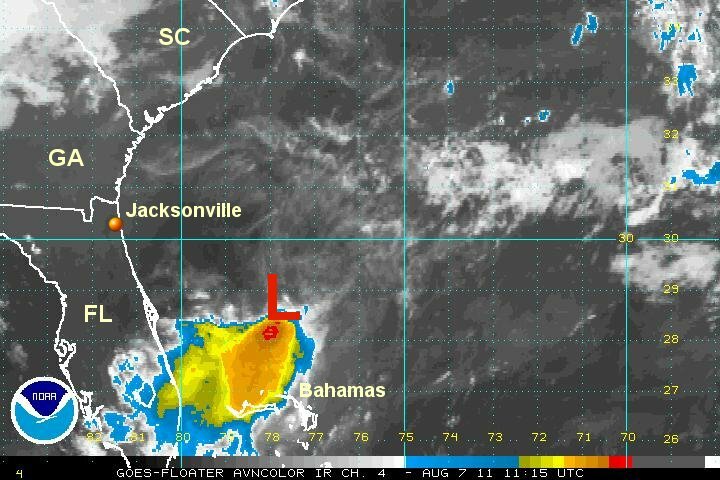 Forecasts show some development as it moves north from the Bahamas. A turn to the northeast is then forecast away from the Southeastern U.S. 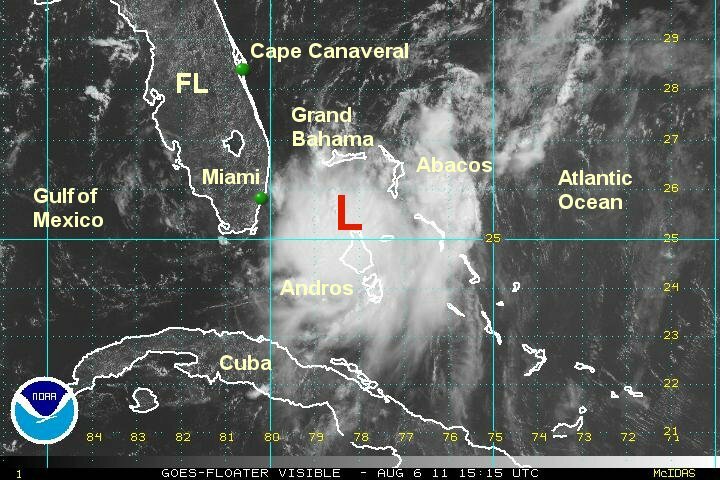 Interests in the northern Bahamas and Southeastern U.S. should follow the regeneration of this low. As expected, the hurricane center brought Emily back to life and started advisories at 5 pm yesterday. It remains a weak circulation and it moving away from the Bahamas. Improving conditions on Grand Bahama Island will be seen shortly as the low moves away today. As of 5 am edt / ast Emily was centered 28.5 N / 77.7 W or 155 miles nne of Freeport Bahamas. It was moving north at 10 mph. Top sustained winds are estimated at 35 mph. Pressure at 1011 mb. Forecasts show Emily remaining weak and moving northeast in the general direction of Bermuda in the next few days. The main threat appears to be rain for Bermuda. Interests in Bermuda should follow Emily.